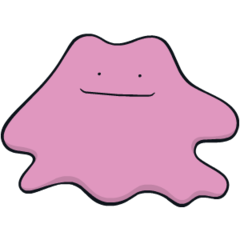 Ditto does not evolve/is not evolved into. X Il a la capacité de modifier sa structure cellulaire pour prendre l’apparence de ce qu’il voit. X Puede alterar por completo su estructura celular para emular cualquier objeto que vea. X Ha la capacità di modificare la sua struttura cellulare per trasformarsi in qualsiasi cosa veda. X 전신의 세포를 재구성해서 본 것의 모양과 똑 닮게 변신하는 능력을 가지고 있다. Y Métamorph peut modifier sa structure cellulaire à sa guise pour se transformer en n’importe quelle forme vivante. Y Tiene la capacidad de reorganizar su estructura celular para convertirse en otras formas de vida. Y Può ricombinare a piacere la propria struttura cellulare per trasformarsi in altri esseri viventi. Y 몸의 세포 구성을 스스로 바꿔서 다른 생명체로 변신한다. Omega Ruby Ditto rearranges its cell structure to transform itself into other shapes. However, if it tries to transform itself into something by relying on its memory, this Pokémon manages to get details wrong. Omega Ruby Ditto verändert seine Zellstruktur, um sich in eine andere Form zu verwandeln. Wenn es sich dabei jedoch auf sein Gedächtnis verlässt, unterlaufen diesem Pokémon schon mal Fehler. Omega Ruby Métamorph peut modifier sa structure moléculaire pour prendre d’autres formes. Lorsqu’il essaie de se transformer de mémoire, il lui arrive de se tromper sur certains détails. Omega Ruby Ditto reorganiza la estructura de sus células para adoptar otras formas. Pero, como intente transformarse en algo guiándose por los datos que tenga almacenados en la memoria, habrá detalles que se le escapen. Omega Ruby Ditto cambia la sua struttura cellulare per assumere molte altre forme. Tuttavia, quando si affida solo alla sua memoria, talvolta dimentica dettagli importanti. Omega Ruby 몸의 세포를 재구성하여 변신한다. 전에 봤던 것을 기억해내면서 바뀌면 조금 다른 형태가 되어버린다. 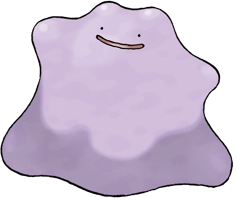 Alpha Sapphire Ditto rearranges its cell structure to transform itself into other shapes. However, if it tries to transform itself into something by relying on its memory, this Pokémon manages to get details wrong. Alpha Sapphire Ditto verändert seine Zellstruktur, um sich in eine andere Form zu verwandeln. Wenn es sich dabei jedoch auf sein Gedächtnis verlässt, unterlaufen diesem Pokémon schon mal Fehler. Alpha Sapphire Métamorph peut modifier sa structure moléculaire pour prendre d’autres formes. Lorsqu’il essaie de se transformer de mémoire, il lui arrive de se tromper sur certains détails. Alpha Sapphire Ditto reorganiza la estructura de sus células para adoptar otras formas. Pero, como intente transformarse en algo guiándose por los datos que tenga almacenados en la memoria, habrá detalles que se le escapen. Alpha Sapphire Ditto cambia la sua struttura cellulare per assumere molte altre forme. Tuttavia, quando si affida solo alla sua memoria, talvolta dimentica dettagli importanti. Alpha Sapphire 몸의 세포를 재구성하여 변신한다. 전에 봤던 것을 기억해내면서 바뀌면 조금 다른 형태가 되어버린다. Sun It can reorganize its cells to make itself into a duplicate of anything it sees. The quality of the duplicate depends on the individual. Moon With its astonishing capacity for metamorphosis, it can get along with anything. It does not get along well with its fellow Ditto. Red Capable of copying an enemy's genetic code to instantly transform itself into a duplicate of the enemy. Blue Capable of copying an enemy's genetic code to instantly transform itself into a duplicate of the enemy. Yellow When it spots an enemy, its body transforms into an almost perfect copy of its opponent. Stadium Capable of reorganizing its cells to transform into an exact duplicate of its enemy. It is usually a shapeless blob. Gold It can transform into anything. When it sleeps, it changes into a stone to avoid being attacked. Silver Its transformation ability is perfect. However, if made to laugh, it can't maintain its disguise. Stadium2 It can transform into anything. When it sleeps, it changes into a stone to avoid being attacked. Ruby Ditto rearranges its cell structure to transform itself into other shapes. However, if it tries to transform itself into something by relying on its memory, this Pokemon manages to get details wrong. Sapphire DITTO rearranges its cell structure to transform itself into other shapes. However, if it tries to transform itself into something by relying on its memory, this POKeMON manages to get details wrong. Emerald A DITTO rearranges its cell structure to transform itself. However, if it tries to change based on its memory, it will get details wrong. Pearl It has the ability to reconstitute its entire cellular structure to transform into whatever it sees. Platinum It has the ability to reconstitute its entire cellular structure to transform into whatever it sees. SoulSilver Its transformation ability is perfect. However, if made to laugh, it can’t maintain its disguise. Black It has the ability to reconstitute its entire cellular structure to transform into whatever it sees. White It has the ability to reconstitute its entire cellular structure to transform into whatever it sees. White 2 It can reconstitute its entire cellular structure to change into what it sees, but it returns to normal when it relaxes.